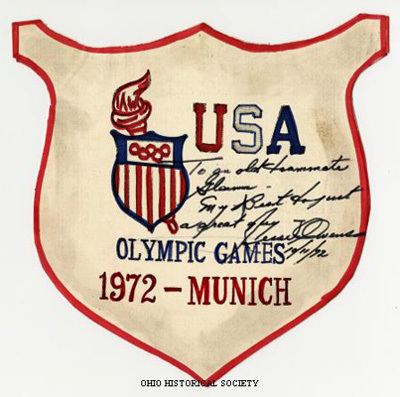 Emblem for the 1972 Olympic Games held in Munich, Germany. It is signed by track and field gold medalist and Ohio native Jesse Owens. He wrote, "To an old teammate Glenn - My Best to just a great guy, Jesse Owens, 10/11/72." Glenn is Glenn E. Price, who was a member of the Ohio State University track and field team with Owens. Ohio Historical Society MSS 1115, AL07661 from the Glenn E. Price Papers Collection.